Dogs may be far more expressive and observant of other dogs than we previously thought. I’ve often thought that if people were more like dogs, relationships between humans would be a lot less complicated. You’d know immediately if someone was truly happy to see you, just by the wagging of a backside. To us, it seems it’s hard to lie or hide your emotions when you have a tail. It turns out, however, that not all wags are created equal. The direction a tail is wagging tells a tale far more nuanced than just whether or not a dog is happy. According to a new study published on October 31, 2013, in the journal Current Biology, canines that see the tails of other dogs wagging to the right feel relaxed, while dogs viewing others whose tails wag to the left makes them feel stressed. Could this be a true form of intercanine communication, or is it purely mechanical—a byproduct of the activation of one side of a dog’s brain over the other? While most owners tend to think that any wagging tail is a sign of happiness, that might not necessarily be true. 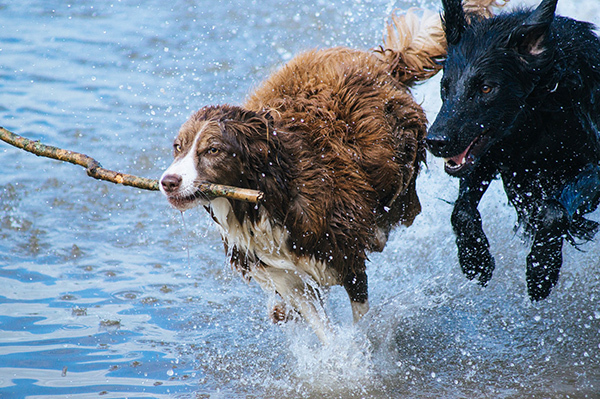 Giorgio Vallortigara, a neuroscientist at the Center for Mind/Brain Sciences at the University of Trento in Italy and an author of the new study, says that dogs have different emotional responses to their peers depending on the direction of a tail wag. Dogs wag their tails to the right when they feel positive emotions, and they wag their tails to the left when they have negative feelings. To conduct their study, the researchers created videos of dogs wagging their tails in a way that was designed to remove all other distractions, except the wagging tail. They then recruited 43 pet dogs of various breeds. The animals were outfitted with small vests that monitored their heart rates. Some of the dogs saw a video that showed a silhouette of a dog, while others saw an edited image of a real dog. In both cases, the only thing that moved in the image was the tail. When the test-subject dogs saw the image of a dog with a tail wagging to the left, their heart rates picked up and they showed signs of anxiety. When the dogs saw images of dogs with tails wagging to the right, they stayed perfectly relaxed—some even approaching the dog on the screen, which suggests that they saw the right-side wagging as a signal of companionship. Vallortigara concluded that dogs, like humans, have asymmetrically organized brains. Left-brain activation produces a wag to the right, and vice versa. For example, a dog’s tail will wag to the right when seeing its owner come home, but it might wag to the left when confronting something it wants to back away from, such as another dog with an aggressive posture. The big question that remains to be answered is whether tail-wagging directional differences are a means for dogs to communicate with one another or whether they’re just physical, mechanistic behaviors, arising from automatic responses rooted in the different hemispheres of the canine brain. Some researchers believe that watching dog tails may open a whole new window into a complicated dog communication system. While Vallortigara believes that directional tail-wagging is an accidental consequence based on which side of the brain has been activated, other researchers think that this study gives us a whole new window into a complicated dog communication system. While humans observe a simple tail wag and assume a dog is happy, dogs are able to perceive the type of tail wag and act accordingly. Thomas Reimchen, an evolutionary biologist at the University of Victoria in Canada, believes this is one of the first studies to show that animals evaluate the left- or right-sided bias of other individuals and modify their behavior in response. He thinks the new study is a major contribution to our understanding of how animals interpret such signals and provides evidence that “docking,” or removing portions of a dog’s tail, compromises its ability to communicate. In addition, Reimchen points out that this study should prompt researchers to look more carefully at side biases in other interactions in the wild, such as those between predators and prey. Whether or not you believe that dogs are truly communicating with each other by the direction their tails are wagging, this new information might help improve dog welfare and perhaps even aid in developing new strategies for keeping our pets calm at the veterinarian’s office. And that makes me shake with happiness, all over. Do you think dogs actually communicate by wagging their tails in a certain direction? Or are tail wags just automatic, physical reactions, a result of brain functioning? 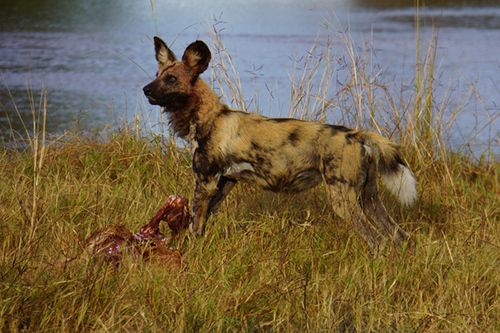 If you would like to observe predator/prey interactions and some of the planet’s rare wild dogs, please take a look at our Africa safari tours. Hi Candice, I have been paying attention to my dog’s tail, but after a month I cannot reach any conclusion, except it waves a lot when trying to bite the postman or Jeovah’s Witnesses knocking at our door, but I cannot sense the direction, if he is nervous or just happy to do it! Interesting research. I cannot confirm this either by observing my dog’s tail and I think there are other non verbal signals as important as tail wagging in dog communication. For example, the direction of the ears. However, it really is exciting that this research shows a difference in response and heart rate at dogs watching other dogs’ right or left tail wagging. Left tail wagging is associated with negative emotions and possibly aggression, directed by the right brain hemisphere. Not a coincidence that especially the right brain hemisphere is responsible for regulating emotions (at least in humans but presumably also in other mammals incl dogs). I had read this earlier and thought it interesting. However, I live with a Samoyed and always lies to the right….I don’t think he could get it to the left side if he wanted. His tail wag is more of a tight shake. ‘Sammy’s’ are known for their tightly curled tails held up and over their backs. But then again, my Sam is always happy…so it’s hard to tell. invite to discuss more about it. If Vallortigara’s contention is that asymmetric wagging doesn’t constitute communication, that is puzzling to me. It seems to me that even if the direction of the wag is involuntary, if another dog sees and responds accordingly, it’s still a medium of communication, much as a blush might be in a human. Great article Candice. There was a show on recently on the CBC called “The Nature of Things” hosted by Dr. David Susuki on dogs. Here’s the link … I hope you are able to view it.